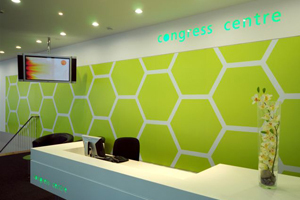 BBC2 is the first client to book Congress Centre in London's newly renovated reception and foyer events space. The Congress Centre in London's new event space is being used as a film location for the BBC drama, Money. Hugh Broughton Architects designed the events space and incorporated LED colour-change lights, which allow clients to project corporate logos. The Congress Centre director Robert Girvan said: "We wanted clients to feel that the venue is an extension of their own brand or premises and this objective has been achieved through the new design."